Microsoft published a new support article "Windows 10 update issues on devices with low storage space" yesterday. Released in time for the next feature update for the operating system, Windows 10 version 1809 also known as the October 2018 Update, it highlights that updates may fail when disk space is low and provides suggestions on how to free up disk space. Microsoft's resolution to avoid the issue is to run a series of operations to free up disk space on the device. To delete temporary files in Settings (Windows-I) > System > Storage > This PC > Temporary Files. To delete downloaded files in Settings > System > Storage > This PC > Temporary Files > Downloads > View Downloads. To uninstall apps that are not used anymore in Settings > System > Apps & Features. To move files to a USB Drive or another drive. Select the files in File Explorer, the Home > Move To > Choose location. To save new files to another drive. To keep only some OneDrive files on the system. To do so, right-click on the OneDrive icon and select Settings > Choose folders and uncheck folders that you don't require on the PC to free up space. The common sense instructions read almost like an advertisement for using the Settings application more as the first part five of the eight suggestions ask you to use it. It is certainly possible to clean the Recycle Bin using Microsoft's suggested method but it is equally possible to right-click on the icon on the desktop to clean it right from there. The latter may be faster. Some users may use the Disk Cleanup tool for some of the operations but Microsoft revealed that it is deprecated. While still available, it will be removed eventually. Storage Sense supports the automatic deletion of temporary files on Windows 10; so that may be an option going forward. As for moving, I suppose using the menubar is the easiest way but most users will probably either use "cut" from the right-click menu or hold down the Shift-key to move files instead of copying them to another drive. More telling is Microsoft's explanation for issues caused by low disk space during upgrades besides the obvious elephant in the room that devices with low amounts of disk space are sold as Microsoft's minimum requirements for Windows 10 devices don't prevent manufacturers from doing so. Microsoft Surface devices are offered with 64 Gigabytes of storage space which is not a lot either but some manufacturers produce devices with 32 Gigabytes of storage space. A large portion of the space is already occupied by Windows. The cause according to Microsoft? Microsoft confirms that "Windows Update does not check systems for adequate space requirements before it initializes". The company does not reveal why Windows does not check for sufficient storage space before updates are initialized. Doing so would certainly help users as Windows could "tell them" to free up a certain amount of disk space before running the installer. While it is certainly helpful if users clean certain files, temporary files or old downloads, regularly on their devices, it should be the developer's responsibility to implement proper checks during the initialization of updates. As Woody Leonhard puts it so eloquently: "You'd think that with all the hundreds of millions MS has spent on Windows installers, it would've fixed the ooops-it's-too-small bug a while ago. Right up there with the "SSU before LCU" ridiculousness". Now You: Did you run into Windows update issues recently? Microsoft published a new support article "Windows 10 update issues on devices with low storage space" yesterday that includes suggestions on freeing up disk space. This is very likely a “strategy” on the part of M$ to convince users that they need to begin storing their personal data on OneDrive. They really, REALLY want everybody to basically begin using dumb terminals so that the company can charge fees for people to access their own data. This is horrible. I would not qualify for these frequent upgrades as I like keeping Windows 7 installed into a tiny 64 GiB partition for easy backup/maintenance. 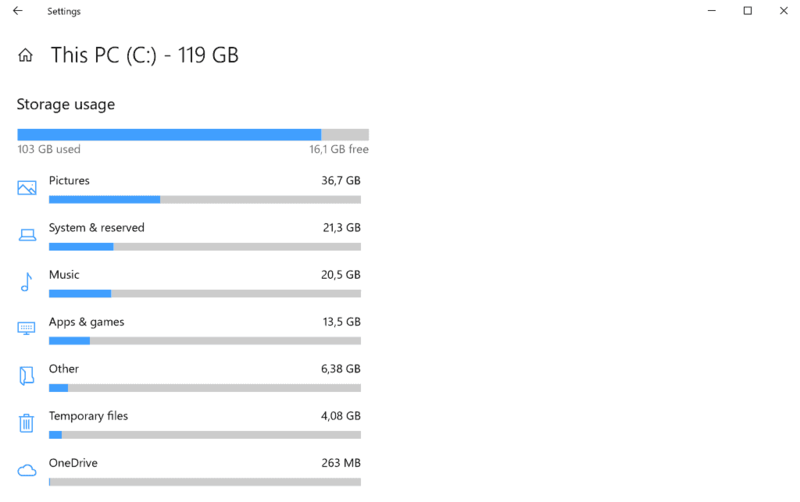 I usually have with less than 20 GiB of free space on C:/ drive. Interesting that you call that tiny! How about my Win7….. 7GB only, and retail box (not a single update) running inside a VM. Works like a dream, and is not even SP1. Thanks MS, don’t need any bloat or stuff from you. I’ll keep my 7GB all-in with no extra help from you thank you very much. I think I’ll be moving a lot of Program Files folders from my 40GB SSD (6GB free) to my HDD just before next months October 2018 update. Martin, Do you have any idea why Microsoft when there on the subject of freeing up disk space are not referring also (or only to) to there one website page who has not only more info about the one hand subject but also, gives a chance to search for low space errors? I use Windows Defender under Windows 10 1803. When doing the August Windows Update as I recall, lack of space resolution was resolved not only by some of this article’s solutions, but also by offered solutions by Defender to reduce its requirements without loss of function, which I accepted. I wish I could recall more detail. Cleaning out previous Windows Update install files is a great way to free up space as those files tend to accumulate and they are HUGE.Go to C drive;Properties, Disk Clean Up; Clean up System files. Just did that today for first time in while. Took off nearly 3GB after a bit. Forgot how much the upgrades build up with left overs. My brain got stuck on thinking after a month those leftovers would auto purge. Nope just those from initial install to Win 10. No biggie in age of big drives & offloading to cloud to declutter space. Like to keep minimum of 50% free space on both drives. Hoping this Oct annual won’t barf all over the place. Lately upgrades have gone pretty well compared to u know what early ones did. Extra space on drive also seems to make PC run faster since more cache space quick access. Using Android under reverse tether & offloading its pictures also eats up drive space until ported to cloud (bless that onedrive/google drive). Have a 32 gb 2-in-1. Moving program files to the non-system disk is the only way I have been able to upgrade in the past – a real PITA. I’m currently on holiday with an HP Slate 7. Specifications are 1GB, 1.33GHz Atom Z3735G 32-bit, 32GB. Prepping that for 1803 was, as said before, a PITA. Do a new install and run most programs from an SDHC. Right now I’ve got Edge, Firefox, Putty, and VNC running, along with a shared hotspot. The best way to free space for blowdows 10 is to uninstall it.. I have a mysterious case where Windows 10 for no reason whatsoever uses up few gigabytes of space and then frees the space again after few weeks or month later. Nothing shows up in Disk Cleanup. I know it’s not from Windows 10 downloading updates in the background since i am using Simplewall to block updates with it’s whitelist mode feature, nor i have installed anything. Under Windows 10 1803 17134.319 I went to Settings – System – Storage and changed from auto to manual. Then I checked only Windows Update Cleanup to save 11.5 gig, which took about 20 minutes to complete. I then did a manual restart. Now I hope I am ready for 1809 when it comes. Any comments on this approach?